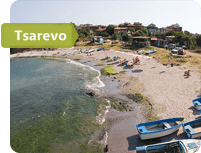 The seaside town of Tsarevo enjoys a truly unique location, spread across three peninsulas and enjoying views out over four bays of the Black Sea. No surprises then, that this is a great destination for a summer break! The area offers access to a range of sandy beaches, dramatic coastal landscapes, as well as the beautiful rolling hills a little further inland. To plan your own holiday to Tsarevo, be sure to talk to the transport experts at AroundBulgaria. With a whole range of Tsarevo taxi services on offer, we’ll be able to help you get the very most out of your holiday to Bulgaria this year. We can take you to absolutely anywhere in the country, with our versatile and fully customisable taxi service. Whether you’re here on business or pleasure – or maybe a mixture of both – we offer a fully flexible service that can be tailored to suit your needs. We appreciate that sometimes you might need to travel at unconventional hours… which is why we offer our taxi service 24/7 for your convenience. Whether you require a car, a minivan, minibus or an SUV, our extensive fleet of vehicles will have you covered. When you book with us, you’ll automatically be covered by our full vehicle insurance. Let us know if you need children’s car seats, or even extra space for your bulkier items such as sporting equipment – we have secure roof racks at the ready! We fit our cars with wireless Internet, allowing you to pass the journey as you surf the web or check emails. You can pick the music you like during the ride, as well as taking control over the interior temperature and air-conditioning. Enjoy complete comfort in our clean and perfectly smoke-free vehicles! Book a Tsarevo Taxi Service Now! Get in touch with us today, and our helpful advisors will be only too happy to help you find the best deal on your Tsarevo taxi service. We can charge either by time or by distance, depending on which works best for you! All prices are fixed as soon as they’re agreed. Here at AroundBulgaria, we never hit our customers with hidden fees or extra charges later on! Don’t worry about advance payments. You can give the money to your driver instead, and only on the completion of your service. Our drivers can accept payments in a range of different currencies… including Russian Rubles, US Dollars and Euros, in addition to local Bulgarian Levs. Don’t forget – there are some great discounts available to any customers booking more than one trip with us. So if you’re a corporate client or one of our regular and returning customers, be sure to ask about special savings when you call to book. For all enquiries, talk to AroundBulgaria today. We’re ready to help you get the most from your holiday to Bulgaria, with our professional range of taxi services in Tsarevo and beyond. The difference with our service is – the driver will not speak English, will not meet you at the arrivals, will accept only cash. We decided to spend our honeymoon in Bulgaria. Our friends recommended us Tsarevo, where they had stayed recently. After the flight landed in Varna, we were faced with the serious problem of reaching our hotel. The distance was not very small – about 200 km. Spotting the advertising billboard of AroundBulgaria.com, we decided to use their service. And we did not regret our decision in the least. We reached our destination in about two hours, and while traveling to it we visited picturesque local sights. While traveling, we talked to the driver, learned about another service, car rental with a driver. We used that service too in the next few days, and we visited the nearby towns. Everything was great!